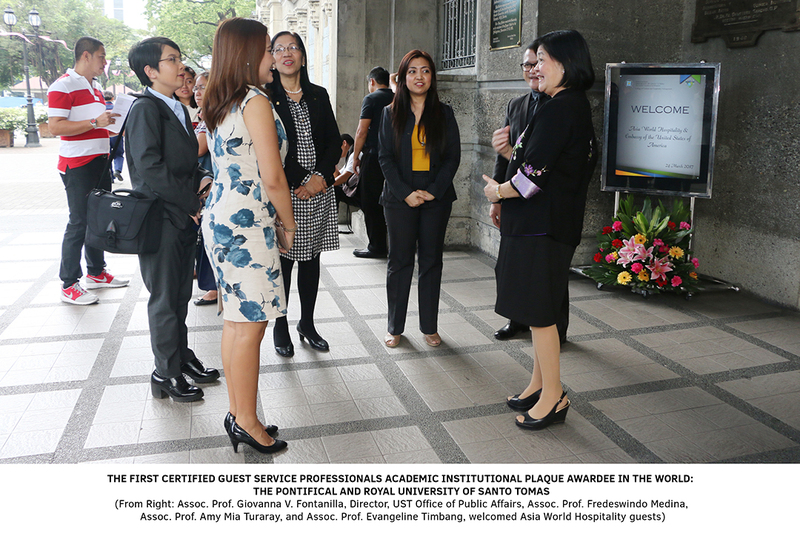 The University of Santo Tomas became the first-ever academic institution in the Philippines and abroad, to be recognized by the American Hotel and Lodging Educational Institute (AHLEI) as a Certified Guest Service Professionals Property. 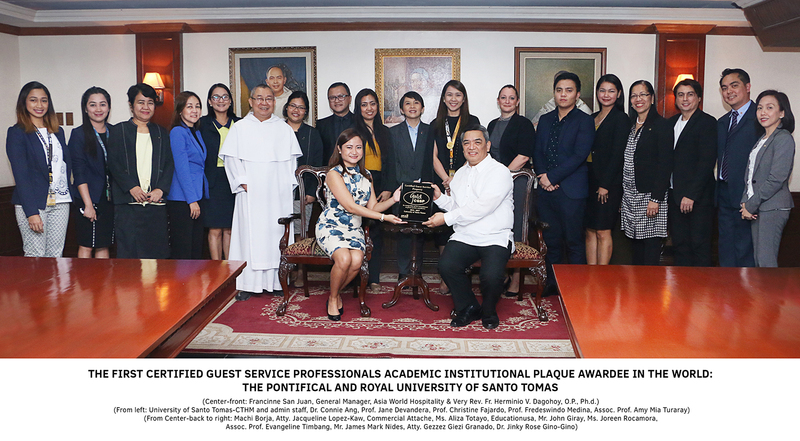 The distinction was awarded last March 24 at the Rector’s Hall in recognition of the university’s commitment to ensuring that its hospitality management educators and staff are regularly trained to provide the highest level of service hospitality to guests and students. 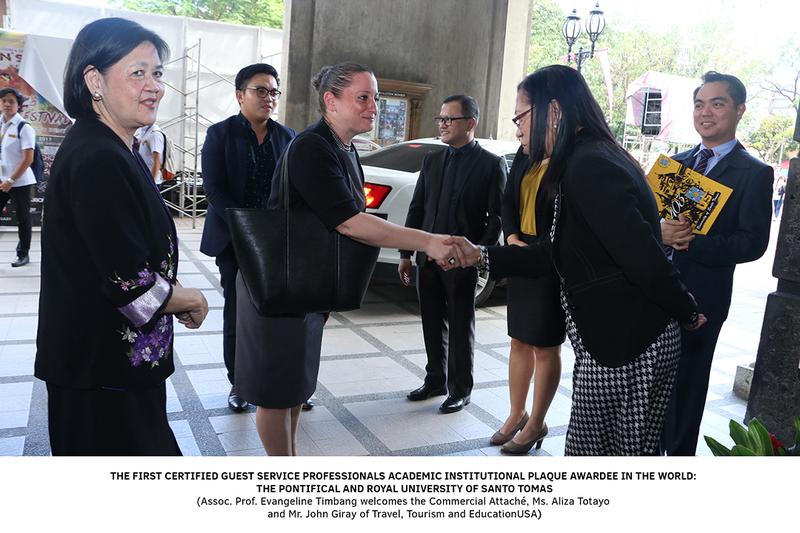 The College of Tourism and Hospitality Management (CTHM) certified its faculty members, staff and soon, students working in the university’s on-site hotel through the AHLEI’s Guest Service Gold® Program, with the staff attaining the Certified Guest Service Professionals (CGSP®) pin and certificate. Earning the Certified Guest Service Property designation is one of many steps UST is taking to ensure that the school is globally competitive. “The university likewise continues to strengthen degree programs in order to facilitate academic mobility for both faculty members and students. This will help develop their competencies by exposing them to best practices in the world.” Rev. Fr. Herminio V. Dagohoy, O.P., Ph.D., Rector (UST), said during the ceremony. The awarding ceremony was attended by the Aliza Totayo, Commercial Attaché of the International Trade Administration of the US Embassy; Machi Borja, Asia World Hospitality Director; and Asia World Hospitality Public & Media Relations Head. Asia World Hospitality is AHLEI’s global partner in the Philippines. 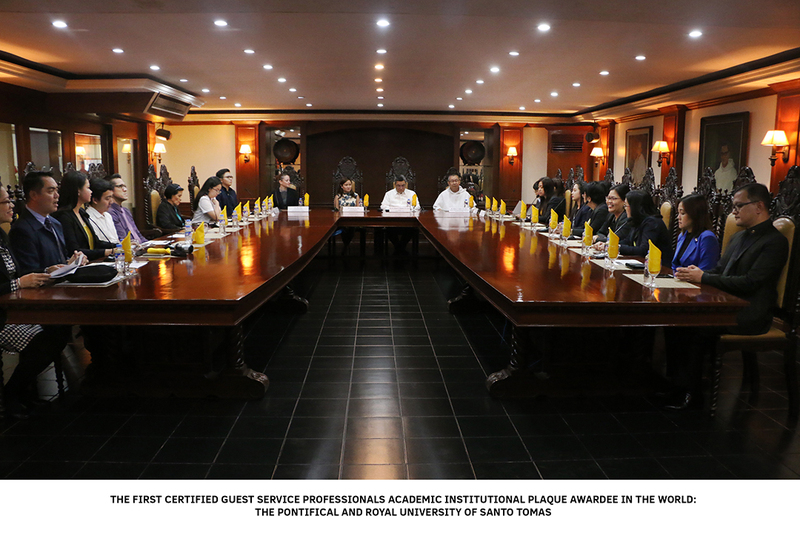 The University of Santo Tomas is one of several academic institutions in the Philippines working with AHLEI to enhance their hospitality programs through professional certification. UST, the oldest university in Asia, was one of three to host a Certified Hospitality Educator (CHE®) workshop and exam session in summer of 2016 to provide faculty members with the opportunity to earn the only professional certification for post-secondary hospitality instructors. 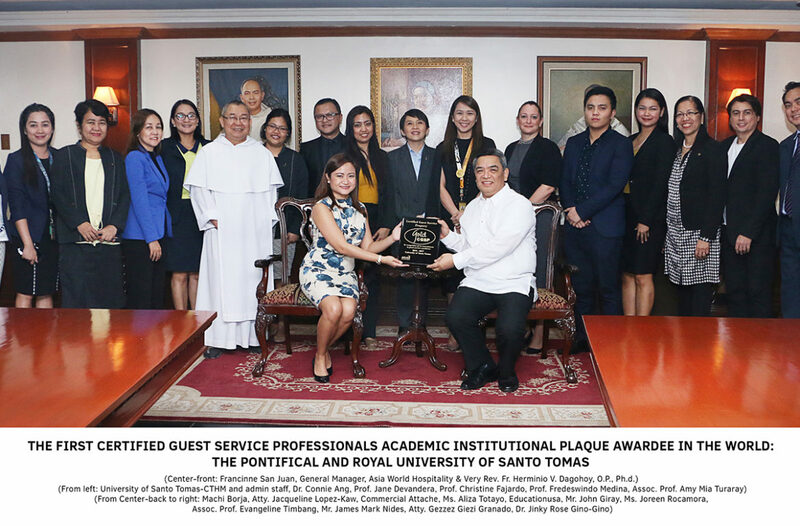 “It is our great pleasure and honor to see UST, the oldest university in Asia, conferred with the Certified Guest Service Property designation as this majestic institution continues to demonstrate inexorable thirst for eminence in education for its students and outstanding reach in pedagogy for its faculty,” said Ed Kastli, AHLEI’s vice president, international sales.